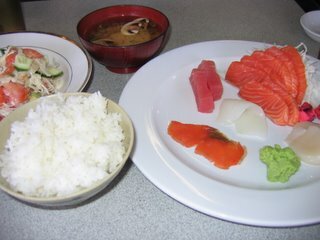 Wow, now that is a pretty small sashimi lunch for $10-$11. There seems to be more Wasabi then fish in that thing. You should come to Hawaii if you like that sort of thing. You can get a whole bunch of Sashimi for only a few bucks here. Hi Joe... sad thing is in Australia that's pretty cheap! Normally pay over $20 for sashimi of that quantity. Next time I go state side, I'll make sure we do one of those via Hawaii flights so I can stop off for some sushi and sashimi.